Priced out of Paradise: What’s Hawaii Leaders Doing? 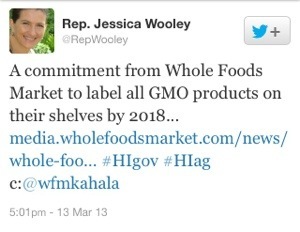 Tweet made by Rep. Wooley back in March 2013. Last night at the Kaneohe Neighborhood Meeting, I had the opportunity to talk to a fellow resident. She came to the meeting because she wanted to speak out about an issue she was having with where she lived. Her and fellow tenants live in an affordable housing complex and were being subjected to a huge increase in rent because the units were sold by the City and County to a mainland developer. She continued to share her story with me about her life and why she came to the meeting. She has worked as an educational assistant at Castle High School. She’s employed but doesn’t make a whole lot of money so a rent increase will leave her with only $100 left over each month. She could live with her daughter but wants to remain as independent as possible. It’s a struggle to make ends meet but she does it. I really started to think about this more later on. There are a lot if people who are in a similar situation to her. Any local person will tell you that cost of living here in Hawaii has been rising. We hear and see it everywhere. Everything is going up: gas, electricity, basic groceries, property taxes, rents, car registrations, sewer fees, and so on. The only thing not going up is our income to keep up with this, and that is a major problem. So many folks are struggling and living paycheck to paycheck as well as working multiple jobs to get by. How can one have quality of life when most your time is spent working just to survive? Earlier in the year, there was a Star Advertiser article that looked at the poverty issue here in Hawaii with kids. The percentage of kids living in poverty was 12.5% in 2005. This year’s Kid’s Count Report found that there were 51,000 kids living in poverty, which is up to 17%! Then when you look at poverty in seniors, the AARP has found that nearly 20% fall into that category. There are a lot of people in need in our state and what is being done to address this? How can we make peoples’ lives better? As I listened to her story, I really thought about the politicians of Hawaii and how they get into offices making lots of promises that we know can’t be kept. Or there are issues that they bring up that don’t really help anyone other than their own personal agendas most of the time. It was really nice to see many local looking folks, most of whom were born and raised here and had long time established families in our communities. As the residents of Kulana Nani apartments sat in the meeting waiting for their turn to speak up, I could not help but think more about this issue. Her answer was that she realized that many farmers are at risk for going out of business and that we need them and she has various programs and things in the works to address this. We all know that when costs go up for farmers, their products will cost more also, which is why local produce tends to be more pricey. Not once did she go on about the labeling issue for biotech food in this answer. I know for a fact that the labeling will mean that food costs will go up since manufacturers will have to specially label food just for our state. How is that really going to help keep basic foodstuffs affordable for people who are already struggling? She didn’t bring up that issue until my second question for her, which I’ll continue on another blog post. Politicians like Wooley and others like her who have decided to align with the activist groups like Hawaii SEED, the Babes Against Biotech, Hawaii GMO Justice Coalition, Hawaii Farmers Union United, and the Hawaii Organic Farming Industry are all about self serving their own interests. They are pushing to grow their industry that may increase availability of organic produce but at a cost that most folks can’t afford. They have plenty of money to fly between islands, stay in hotels or other accommodations, or get funded by their supporters through subscriptions or gofundme.com and don’t have to work like the real local people. When you have a lawyer for a husband who makes a decent salary and a property in San Francisco, it is easy to tout your agenda. It’s easy to listen to activists’ cries for a label for food that many of them consume for the sake of pushing your agenda and forget about your real constituents that struggle for years. Have some empathy for these people Rep. Wooley for they are who you need to work for. A good leader will look at all the issues, use evidence and best practices to help solve the problem, which is always more complex that what it appears. Remember that you were elected by the very people in your community and should be lending your ear to them first and foremost, and not to a Babes Against Biotech activist or an outside environmental attorney, whom you fondly call Andy Kimbrell. Is a Senator Implying Something? When your write to a senator and they respond back to you with this kind of statement, what does it sound like to you? You really should be contacting your legislator now to demand that GMO foods be labeled! Listed are some reasons that you can include in your letter to prove your points also. Feel free to use it. 1) Monsanto owns everything and anything, including the sky. You’ve heard it from your aunty and your uncle and your brother’s friend’s sister that Monsanto owns the whole world. Yes, the seed companies don’t even make the top 25 biotech companies in the world but you still believe everything that is told to you. And because of it, you think they control everything including the weather with their purchase of the Climate Corporation. When one person tells you that the skies are filled with chemtrails, you trust them and believe them. That also explains why there is always rain predicted on your anti-GMO marches. 2) Natural News told you that you will get cancer from it. Natural News also suggested that you to rub urushiol oil as the ultimate sunscreen to protect yourself from skin cancer. 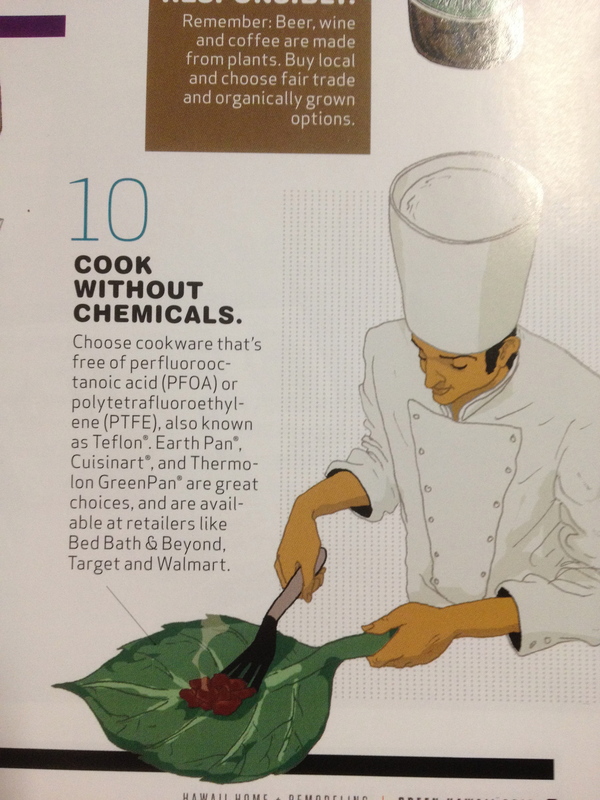 3) The last issue of the Hawaiian Electric Company’s Green Hawaii Magazine stated that you must cook chemical free. GMOs all have chemicals in it. You don’t quite know which ones and don’t even realize that you yourself are made up of chemicals either. 4) WALTER RITTE TYPES ALL IN CAPS AND IT MUST MEAN THAT WHAT HE SAYS IS TRUE. YOU CAN ALWAYS TRUST SOMEONE WHO TYPES LIKE THIS. HE FINDS HIS EXPERTISE IN SURFERS FOR HIS FOOD KNOWLEDGE AND EDUCATION. 5) The Babes Against Biotech show folks that less clothes means more expertise in what is natural food. That includes silicone and some botox tucked in the right places. When they tell you to demand a label, you can trust a woman in a bikini. 6) You can trust a bus driver grandma who is a self professed expert on GMOs that you need that label. When someone reads the latest things off of the internet, you can bet that it is true without a doubt. 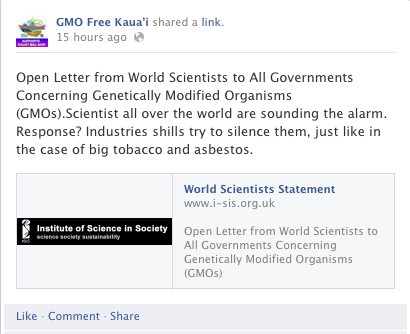 7) GMO Free Kauai has a very long and thorough list of scientists to prove that GMOs are dangerous. That list includes world renown scientists like Dr. Dennis Poopy, Organic Eater, Dr. Ye Hua with 20K piece of art in China. 8) When a holier than thou art food store tells you to demand a label, you should. Forget the fact that the more they advertise their GMO free foods they profit nicely also. Fuel the fear and you will get more people to buy into your scheme and demand that label! 9) Hawaii wants papayas from Mexico, Thailand, and Brazil instead of local. Keep demanding that label so Hawaiian papayas are shunned by customers. 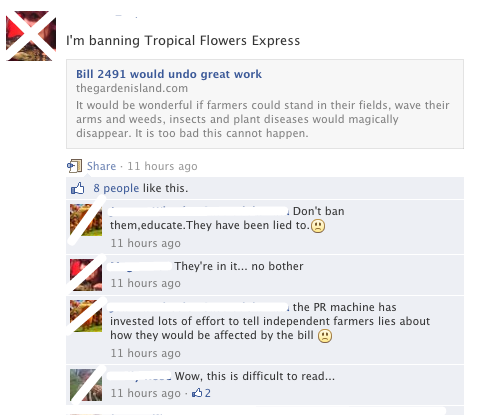 That’s the goal of Hawaii SEED is to kill off just a few more farmers. 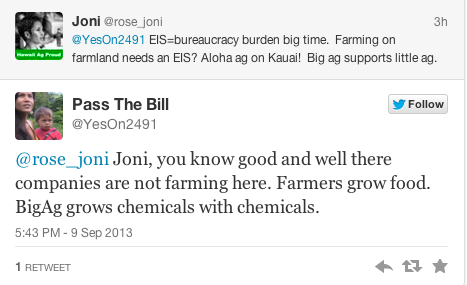 10) Roseanne Barr told you that GMO are bad and that Hawaiians support crop destruction. 11) A wealthy bunch of transplant lawyers from Earthjustice told you to speak up but don’t be rude when you make demands. They can easily afford organic food for their families but you’ll have to wait until you get that label to make it affordable. They have to keep getting in environmental lawsuits against the state so that they can collect on their court costs to keep them buying organic. And these same lawyers quickly turn around and eat GMO food with anti-GMO county council members too right after telling others that it is dangerous. 12) You can become allergic to any and every antibiotic there is on earth from eating GMO food. If this man says its true, then by golly goodness it sure is! Forget the fact that we’ve been modifying genetics in food for thousands of years, DNA has antibiotics and chemicals that will trigger immunosuppression in your shikimate pathway and cause symbiotic endotropy escalation. Yes, it is that bad. 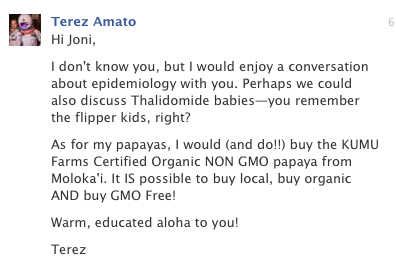 13) There is thalidomide in transgenic papayas and you must demand a label for it because Terez Amato says so. 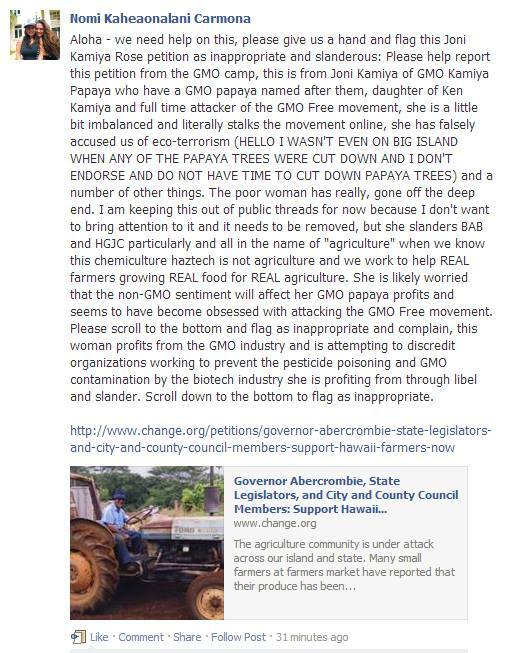 14) GMO Free Mom also knows that transgenic papayas need labels because it contains Bt in it. 15) Sol Kahn believes that if people disagree with him at the farmers’ markets then he has a right to that label as well as a right to say bad things about him on the social media. 16) Jessica Mitchell of the Babes Against Biotech believes that her organized thinking and expertise in chemicals and plants support her claim to a label. 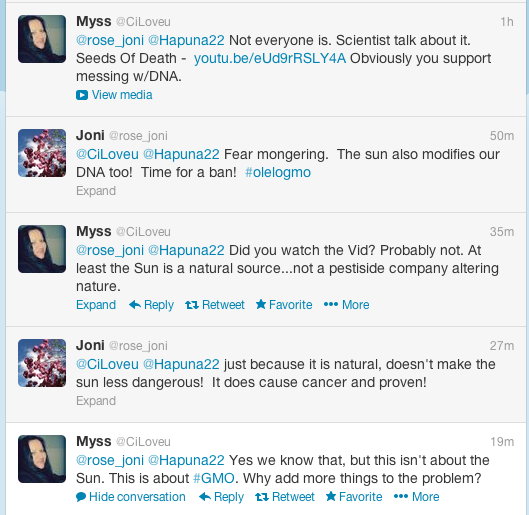 17) Twitter user CILoveU can’t believe that the sun can alter DNA and as a result of watching “Seeds of Death,” she has a right to know what she thinks she knows. 18) Apa Romano knows that there is an alteration in one’s body fauna when she consumes GMO and needs a label to know it. Now what is body fauna? 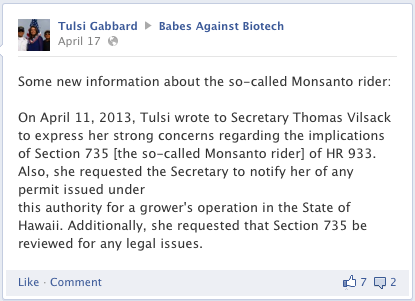 19) If Tulsi Gabbard associates with the Babes Against Biotech then you know that she is getting expert advice. She can even tell what groups are shills and will tell her constituents also. She’s also part conspiracy theorist too and believe in the Monsanto Protection Act. 20) Consumers need a label because it is all about transparency and obeying the law and doing what is right. These leader stands up for what is pono, including death threats to the mayor. 21) Jessica Mitchell doesn’t need a science class to know anything which is why she demands a label of her food. She might not be able to know what all the ingredients are but she has to have that label! 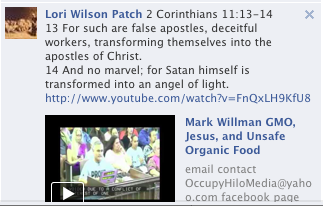 Please don’t tell her that organic foods do indeed use pesticides! 22) Sol Kahn has been telling many residents that if you live by a seed farm, you’re living by poison. Home values are going down and he can’t figure out his relationship to why it’s happening. Label it, disclose it, whatever. 23) Celeste Harvel demands that GE food be labeled and she wants farmer’s crops to be chopped down too. She also nicely articulates her point of what’s wrong with it and shows her expertise in her comments. 24) Lori Wilson Patch believes that this issue should be one where we must sit down and pray for people because her religion has told her so. You can be sure that god is asking her to pray for this evil called GMO. 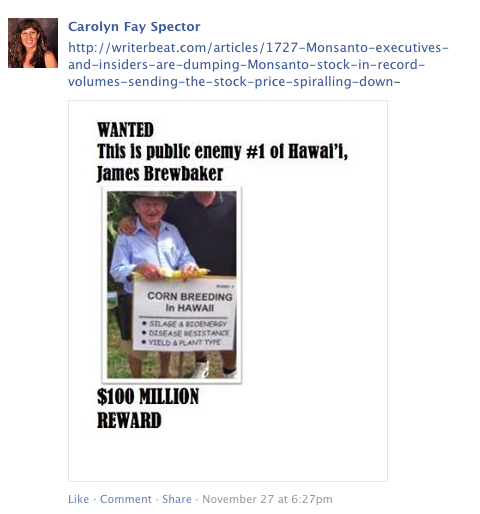 25) Carolyn Fay Spector thinks that she needs to put a wanted poster for Dr. Brewbaker since he donated a million dollars to help CTAHR. You can bet she will be front and center asking for a label. 26) Merci Ritte doesn’t realize that we are made up of chemicals but believes that there are indeed chemicals being grown. She has a right to know these chemicals! 27) Sherrie Moore demands a right to know and will openly boycott local farmers who speak out for biotech. She deserves to to have her food labeled but truly wants her food GMO free. 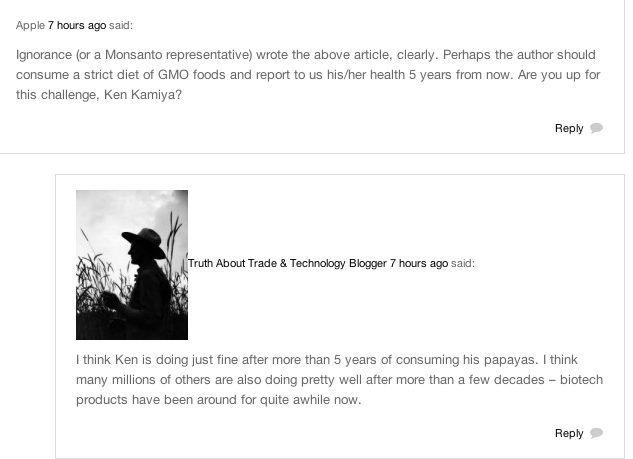 28) Karen Chun knows that GMO papayas didn’t save the industry because she doesn’t grow it or even own a farm. She has no clue that her talking bad about papayas is the real reason why people don’t accept biotech food. She right there front and center demanding her right to know what she’s eating! 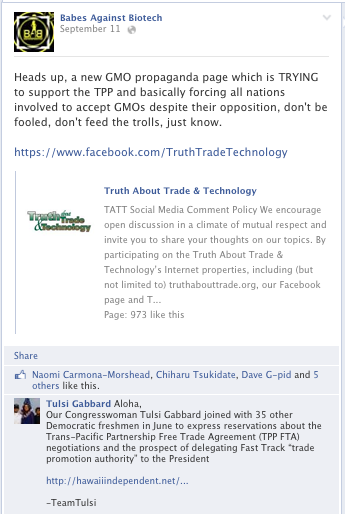 29) Dustin Barca feels that anyone who speaks against Ohana O Kauai must be committing a crime against humanity. That’s why he has to have his food labeled. 30) Nomi Carmona of the Babes Against Biotech can’t imagine that anyone would speak up against activists and will encourage others to block such attempts. You can be sure that she’ll be visiting legislators and demand that she needs her food labeled. 32) Sky Wittenbach does know his genetics and how to sort fantasy from fiction. When he talks, you should listen to his expertise. So politicians of Hawaii, are you going to listen to these people demanding a label and more regulations on farmers? Your loud constituents are really helping all farmers and doing our islands a huge favor. Thank you for listening to them and not listening to the farmers. Rep. Jessica Wooley stated that she would like GE food labeled and would support an education campaign. How do you plan on educating these folks Rep. Wooley, when you yourself make up stuff by stating there is no regulations around it and bungle up the GMO is the same as pesticide issue? We appreciate all the support we get from the leaders of our islands as we work on our farms. The future generations are very secure in knowing that you’re supporting them. Or are they really? Where’s the Giving Spirit of Gary Hooser and Club? It’s the holidays and to me that is a time for giving. It is a time to get together with friends and family, catch up on old times but also a time to give back to others who aren’t as fortunate. Every single time I go the to market or to the store, I always have some cash handy to let my kids drop into the Salvation Army donation can. I also make sure that I gave my yearly donation to the Washinton University scholarship fund and to any other new cause that might need some help. This year I did give a donation to the Golden Rice campaign to help promote efforts to get to the people who need it the most. There are many people who could use that extra support at this time of year and if I have anything to give, I’ll freely give it if I can afford it. To me, that’s the right thing to do at this time of year and really, throughout the entire year. Following what’s going on in the social media, I was surprised to see that the Gary Hooser is once again riling up his anti-GMO club. 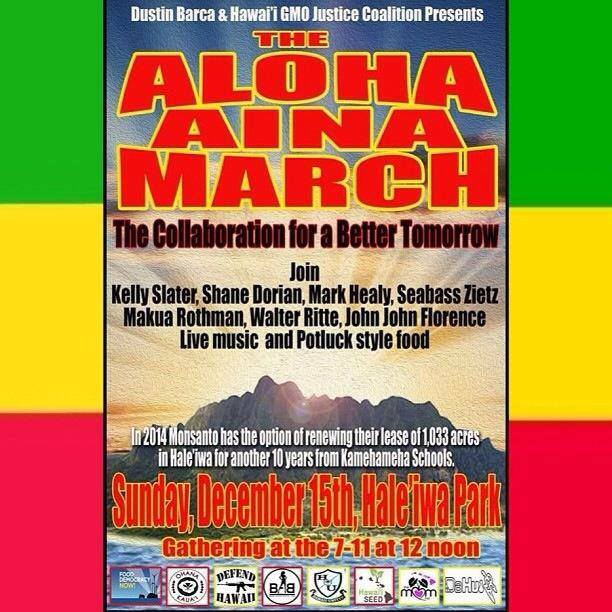 Tomorrow, December 15, all of his club members from the Babes Against Biotech to Hawaii SEED and more are going to do yet another march. All this human energy and resources are going to be used just a few days before the holidays to once again protest and get together. People are flying in from lots of outer islands to gather in Haleiwa essentially for an anti-GMO party. 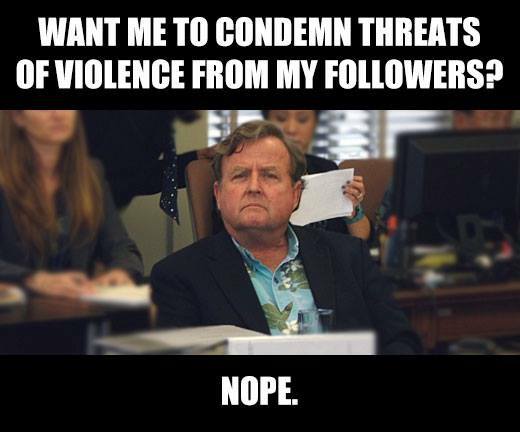 Gary Hooser, the head Kauai County Council member riling up these folks even blogged about this march to promote and advertise it to others. If you read it, he’s perpetuating his myths and conspiracy theories to get people “to rise up against this” and even thinks that people are “more educated” about the issues. I find it rather sad that Gary feels that during the holidays, he’d rather see people march against something and use all of these resources to do such rather than help others in the communities. It is really sad that Gary Hooser has really lost sight of what the holidays mean and about teaching others to give. Consider what he really could have done that would have made someone’s holiday just that much better. If every person who flew into this march opted not to go and donated that some $200 to a charitable organization, wouldn’t that be such a good thing? Instead of using Honolulu City and County resources to cover the expenses of the march, these public funds could have been used in a different program to help the homeless or do something for a kupuna through one of the programs offered in the county. How about using all this human energy to visit lonely people in nursing homes or help organize a holiday food drive? These same people could have spent the day going into the native forests and cleaning out invasive species too. Instead of going to the march and potlucking it, go to the IHS in town and feed the hungry that day. These folks could even bring along their kids also to teach them what the holidays really mean. 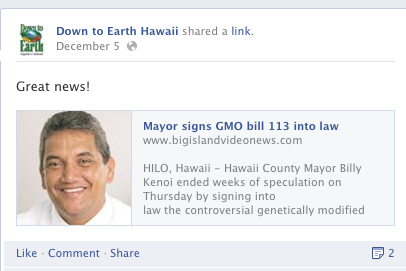 Hawaii SEED even got a nice $10K check from Surfer Magazine to continue their misinformation campaign against farmers. It’s all about how to pit farmers against farmers and not about healing the farming community with Ritte and his group. I’ve never seen any Hawaii SEED give the needy food drive or help others event. They obviously have some money but aren’t about to give any of it to people who may benefit from it. You don’t see Hawaii SEED on the donation list for The Good Neighbor Campaign on the Star Advertiser. It’s not about sharing with others unfortunately, no matter what time of year it is. The more you see what these people do, the more you see that it isn’t about giving for them. It’s all about taking away. The anti-GMO club even had a float in the Pearl City Parade also where they passed out flyers and GMO free candy. Instead of self promoting themselves and their issues, why didn’t these folks use that time and energy to actually give something back? What if they didn’t spend that extra money for GMO free candy and donated that proceeds to the Hawaii Food Bank for someone who really needs nourishment? They could take their kids with them and a nice sack of food to give to people who need it. It is so disappointing to see that they continue to promote the fear mongering that make the most vulnerable of people afraid and guilty of what they are eating, while many of them partake in GE foods and admit that it is safe. A leader should embody and speak for the values that others should live by so that we can make our society a better place. We all should be working together to solve the problems of the world, not seeking to continually divide it. It’s the holidays where we should be working on making life better for others. The leader should be the example to others to follow by. 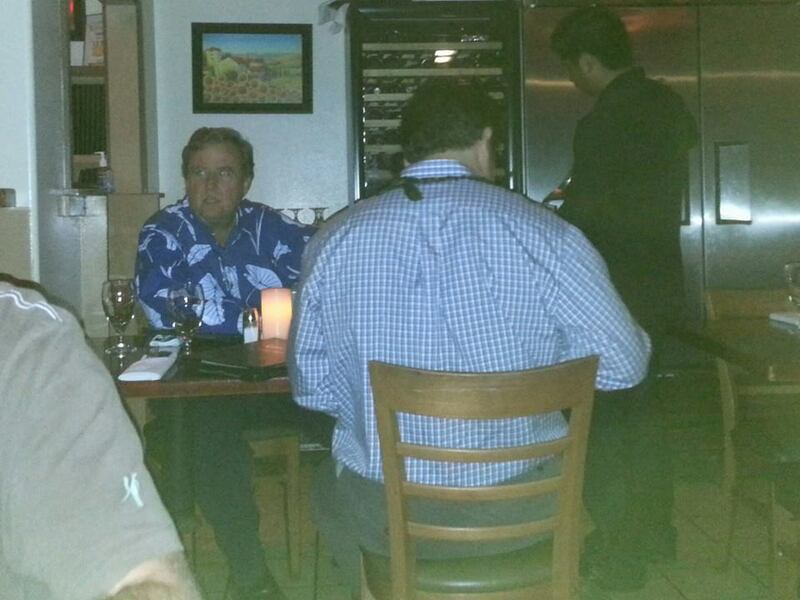 Hooser talks about malama the aina and doing what is pono but what about malama the people too? It is pretty obvious that Gary Hooser is not one of those leaders. By the way, if you should decide that you want to give to others at this time of year, here’s some great organizations that I think are worthwhile causes to support. Remember that this is the spirit of giving and paying it forward. I did it and I hope you do too! 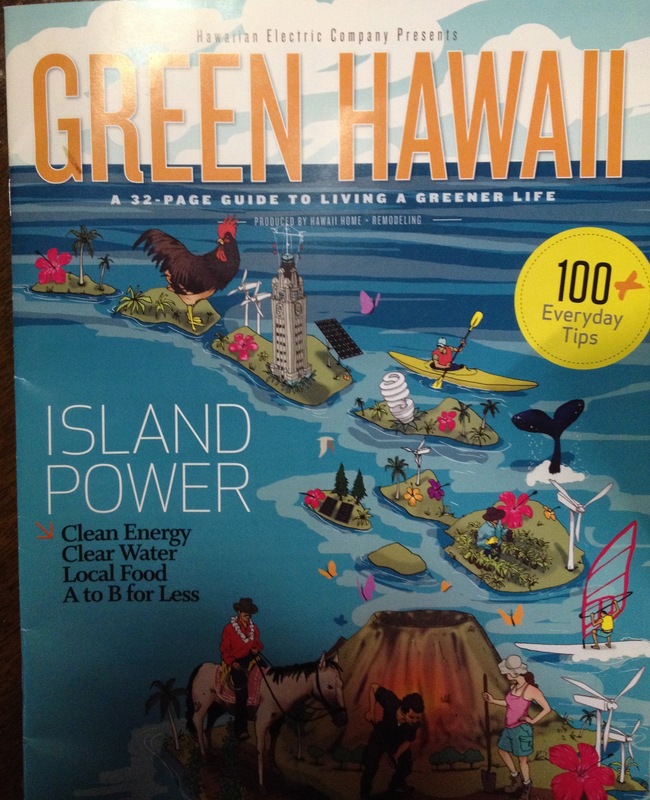 I recently received this lovely, glossy magazine from Hawaiian Electric Company in the mail a few weeks ago that I decided to browse through it. As I was reading through it, two things caught my eye. 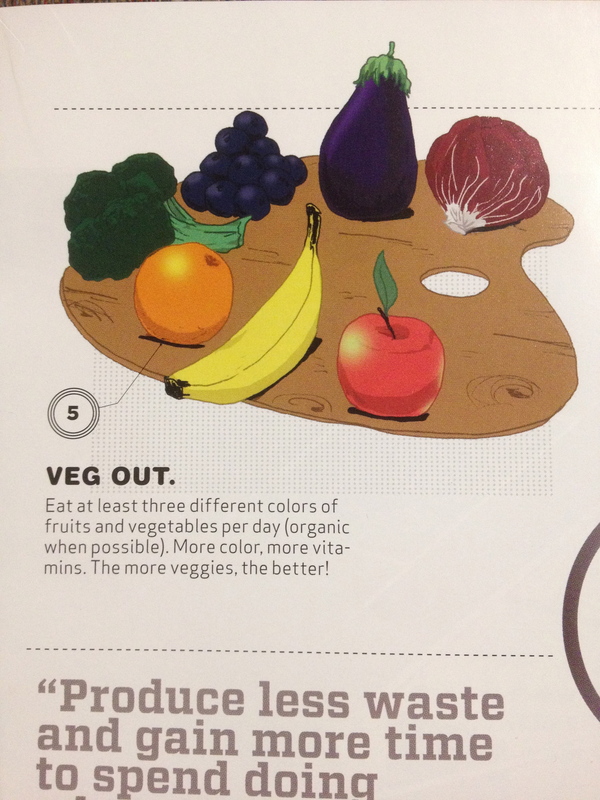 Note what this has to say about ways to improve your health by eating more fruits and veggies, but to go organic. Hmm… There is no mention that there isn’t a significant benefit found for eating organic though but it touts it. 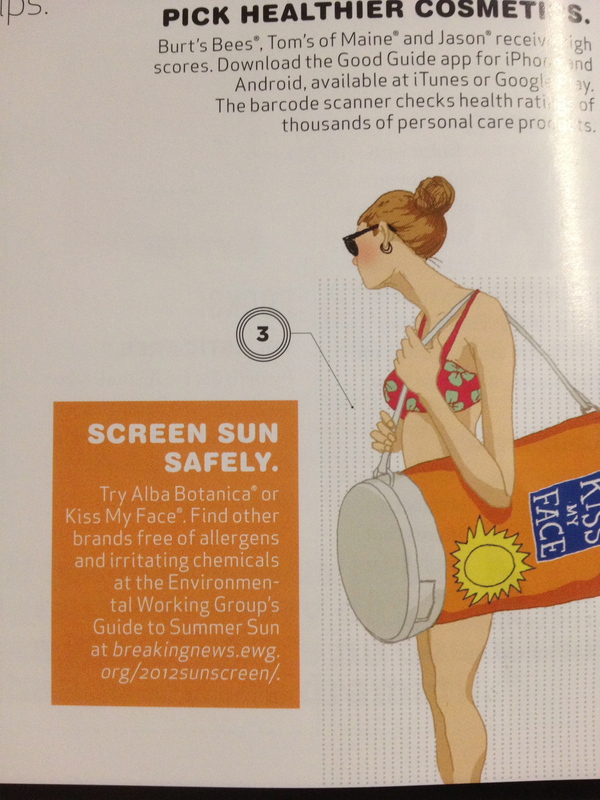 Then there’s one about The Environmental Working Group’s advice on sunscreens. That’s the same group that does the list of dirty produce which is a scam piece of advice also. Then there was also this one too in there about drinking alcohol. The most disconcerting statement on their list is this one, “Cook Without Chemicals.” Um, HECO, everything is made of chemicals! Even the American Cancer Society does not support this statement. If you are going to promote being efficient and lowering our impact on earth, going organic doesn’t translate to a more healthful product according to studies comparing it. Just the labeling of something can influence one to have a different idea about it even it if is the same. HECO is promoting this kind of information without any source and then people just believe it. It also makes people who can afford organic feel bad for purchasing conventional food for no reason. Shouldn’t this publicly funded organization be considering the evidence when it publishes things like this? Isn’t that the responsible thing to do? I’d think so. The worst offending piece of information that I found in there was this gem. 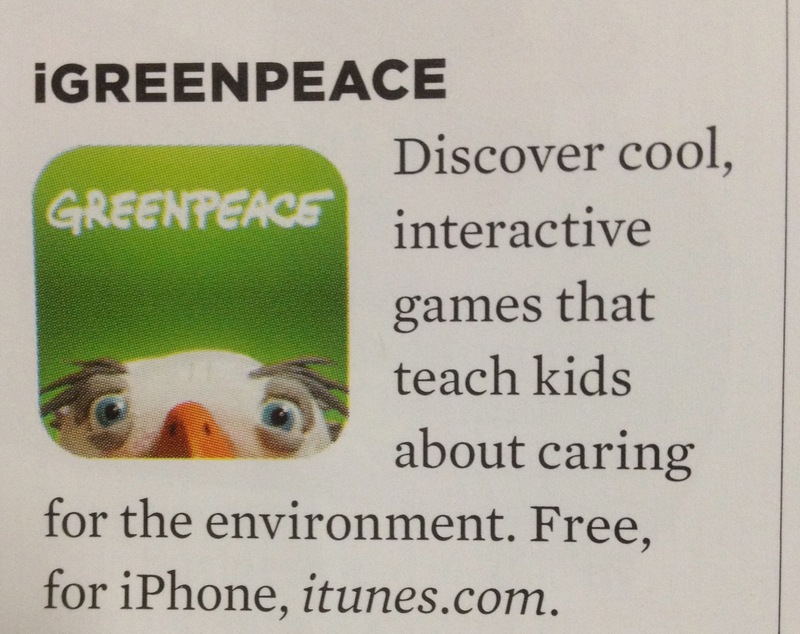 Come on now HECO, Greenpeace?! Really? I always find it interesting that I get these mailers about going “green” in the mail since how many people actually read it and will use the information before it hits the trash can? Is that really going green? I also learned a tip or two from my brother that these kind of magazines with gloss coatings are not recyclable either and aren’t too biodegradable either. I’m starting to realize that this green movement is kind of like a sham full of hypocrisy! The Hawaii SEED version of Greenpeace photo shot. Hawai`i SEED incorporated as a non profit 501(c)(3) in September of 2005. The corporation is organized for charitable, educational and scientific purposes to educate the public, government and business community about locally-based agricultural systems that create real food security for Hawai‘i and about the risk posed by certain agricultural and food systems while protecting human health and the environment. Activities of Hawai‘i SEED include bolstering the community of sustainable farms and farmers throughout the state of Hawai‘i. By providing workshops to farmers, we hope to deemonstrate alternatives to genetic engineering. 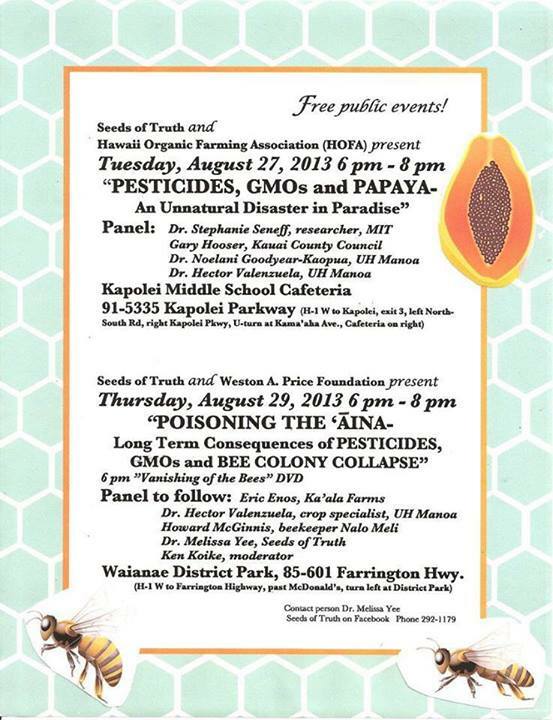 Hawai“i SEED facilitated the public testing of papayas for citizens throughout the state to determine if their fruit is contaminated with genetically engineered organisms. Hawai‘i SEED also conducts general outreach to raise awareness about genetic engineering and alternatives to genetic engineering at public speaking events, and media outreach. We also give presentations to agricultural and other community groups about GMOs and their alternatives. While the GMO Papaya is resistant to papaya ringspot virus, it brought many more problems than it solved. The GMO Papaya has closed lucrative export and organic markets and always has a low price point. This technology has come with too many strings attached and Hawaii has lost almost half of its papaya farmers. This group constantly touts anti-GMO wording like contamination and so on to disparage papaya farmers and wonders why papayas don’t sell well. 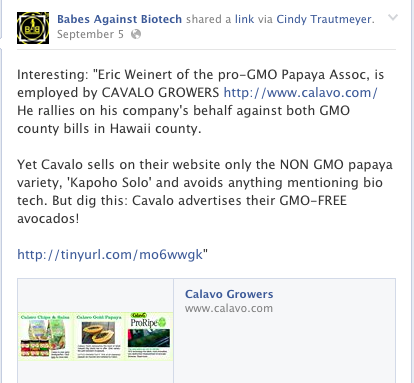 They proudly proclaim how they help test for GMO papayas but what good is that? 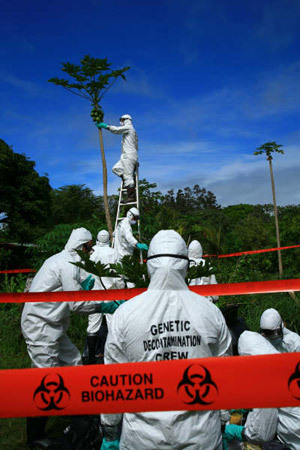 Why not spend that money creating your non-GMO virus resistant papaya if you really want to have sustainable agriculture? 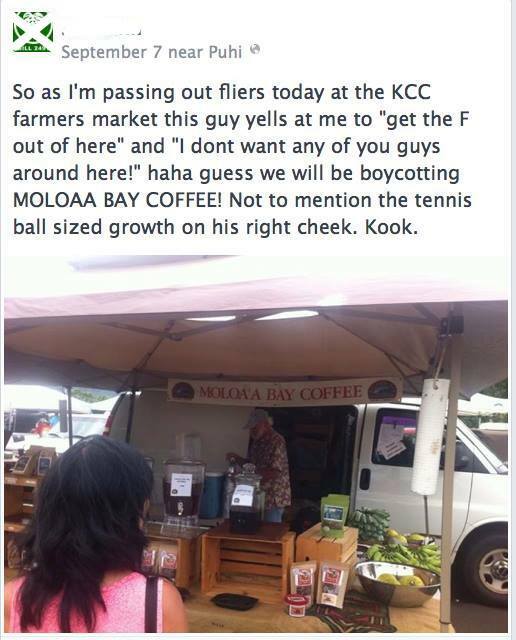 Then Hawaii SEED has to go on complaining how Hawaiian papaya is not being accepted in the worldwide market. 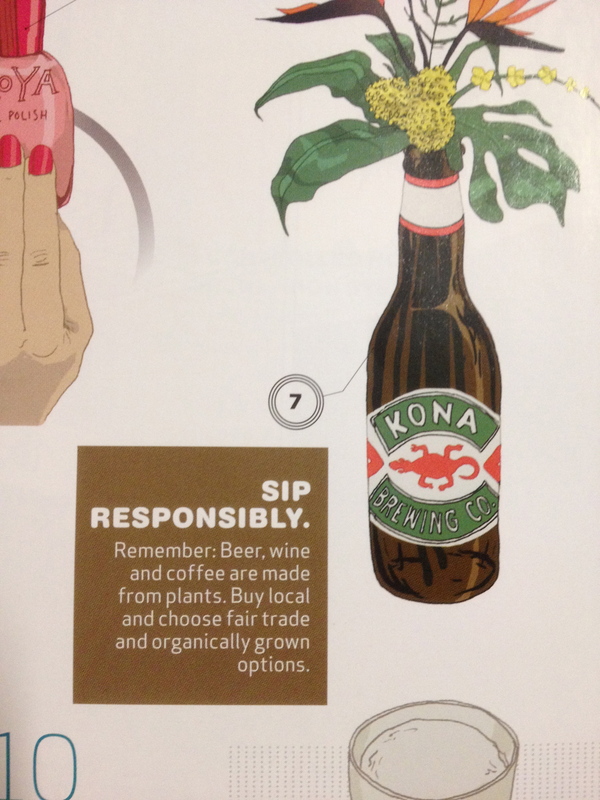 Um, if you’d stop spreading untruths about it, maybe more consumers would not be so afraid of our Hawaiian fruit. Support all papaya farmers and maybe you can sell it better to help all farmers. Hawaii SEED is not about doing farmers good, they are about taking things away like all activists. They contribute nothing to Hawaii agriculture. That’s the bottom line with these folks because it is all about taking and not giving. This group is a far cry from local folks too as we know it is being funded by outside contributors big time. 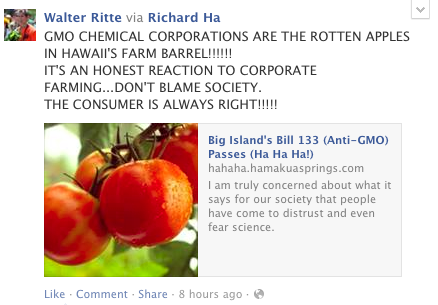 The truth is that Mr. Ritte enjoys his papayas and doesn’t care if it is GMO or not because he knows that it is fine. Remember the March ag day Mr. Ritte?